Organizations w/ high levels of employee engagement report THREE TIMES higher revenue and profit than firms with lower engagement levels. Challenge is only 16% of all employees are operating at peak performance (their maximum effort), with employee engagement at less than 30%. Whom is your organization is managing this at a leadership level? Is it a priority? What specific initiatives do you have in 2019 around it? I find organizations are short on details whether they are a Fortune 10 company or small organization. You can 3x to 10x your metrics with the least amount of money spent on anything you do. It can be in 6-8 hours per year per employee. You can essentially pay for your ENTIRE workforce in 2019 out the increase plus the costs to do it (i.e. free labor). 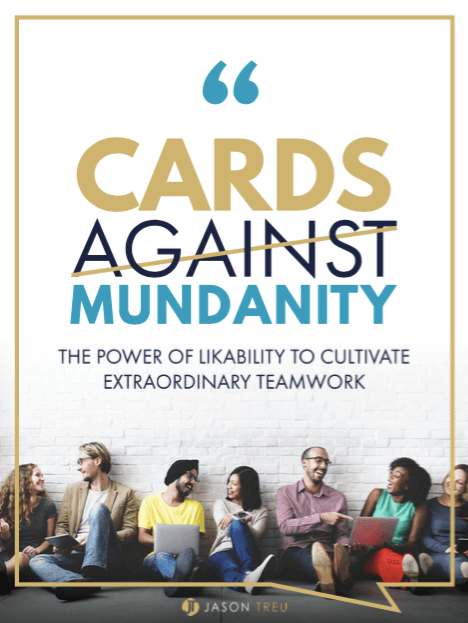 One way is to download my free team building and performance game, Cards Against Mundanity. Takes five minutes to set up and play. Increases engagement, team closeness, trust and performance by 20%+ in 45 minutes or less. You’ll also find suggestions through out my blog and what you can do.